During sideways (lateral) movements, the contact points are constantly changing from one moment to the next, as if the round cusp surfaces were rolling against each other (Figs 5-60 and 5-61); in this case, the anatomical shape of the cusps is assumed. Consequently, the momentary surface pressure for identical masticatory pressure is far greater with punctiform contacts, and hence the actual masticatory activity is more efficient (see Fig 5-60). In other words, when a contact covers a large area, more masticatory pressure has to be expended to obtain the same surface pressure per portion of that area. This in turn means that lateral movement leads to relatively low transverse stresses on the teeth when the contacts are punctiform. This is because the same crushing work can be done with less masticatory pressure (similar to a sharp knife, which requires very little force to cut efficiently). The small, alternating grinding area reduces excessive wear on the teeth. When there are several punctiform contacts, the contact area is "rougher," so the food can be broken up and crushed more effectively (Figs 5-62 and 5-63). With punctiform contacts, the progression of force is clearly defined; ie, force is transferred to a definite point and not to a large area where it might result in uncontrolled tilting. The three-point (tripod) contact of a cusp in its contact area is mechanically stable and well defined. This stable position is a prerequisite for centric occlusion (Fig 5-64). In this illustration of punctiform contacts, abrasion areas on teeth would seem to be signs of wear that diminish the value of the system, following the analogy of the sharp knife as a technical tool. However, comparison between a technical and a physiologic system ends here. 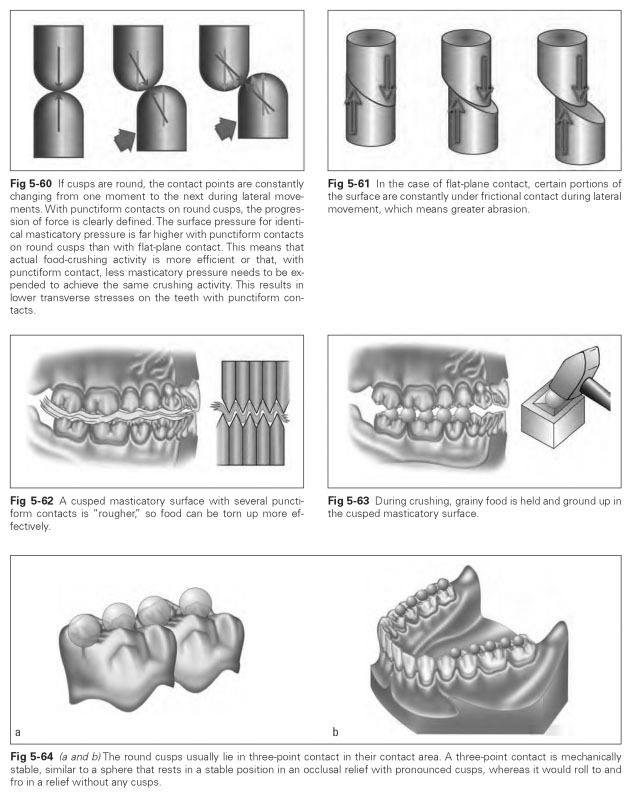 In a physiologic system, the sharp-cusped chewing surfaces help to ensure that all the parts of the system can differentiate. As the teeth grow, their position is guided by the occlusal patterns of their antagonists; then the roots and the periodontal tissues differentiate in response to the arising masticatory forces until they reach their optimal form. In the process, the TMJ, muscles, and habits of movement all develop into a harmonious system. In a normal masticatory system, areas of abrasion will grind equally harmoniously, and this should not be seen as diminishing the efficiency of the system. When reconstructing masticatory surfaces, it is easier, more accurate, and hence more physiologic to create punctiform contacts, irrespective of whether the above-mentioned advantages can be achieved. This cannot be achieved with the same certainty if the contacts are flat. The above outline of the advantages of punctiform contacts requires further clarification. The momentary contact point on a model can be used to do this, because the cusps are idealized as spherical surfaces. On contact, the spherical surfaces are directed past each other. The spheres do not turn but rub against each other. However, no contact point on the spherical surfaces can constantly be in contact throughout the whole movement. By contrast, if two flat surfaces glide over each other, some areas of the surfaces will have frictional contact throughout the whole movement. Where masticatory pressure is identical, frictional resistance and hence transverse stress will be the same for punctiform as for flat-surface contact. However, punctiform contact has the advantage of requiring less masticatory force for chewing activity than is needed with a flat contact. This means that transverse stress will always be less with punctiform contacts. For this to be true, the contacts must lie exactly inside the physiologic system. Incorrect positioning of contact points leads to faulty contacts during lateral movements, which interfere, are more prone to grinding, and place more stress on the periodontal tissue. Areas of abrasion on replacement crowns are an indication of such faulty contacts.